Firstly, how are you finding the Insurance Practitioner Apprenticeship programme? Especially the transition to distance learning? I'm really enjoying the programme and I am now in my second year. This is my first experience of distance learning and to be honest, I knew very little about it before I began. Initially, I wondered how it would work in practice, as to me, the thought of learning online with a lecturer (in a booth), talking to students logged in around the country, seemed a little extraordinary. My lectures happen in real time, but it takes a little time to get used to not physically seeing someone presenting in front of you. I found initially that I was easily becoming distracted by what was going on around me.That being said, as I have become more familiar with the structure, it's gotten easier and makes more sense. One of the biggest challenges for our studying members is balancing work life and social life. How did you manage it and what tips do you have? Working full time is tough on its own. I found that with the added pressure of assignments and exam preparation, there is very little time to socialise, so I had to prioritise what was most important to me and focus on the bigger picture. I try to get out for a run at least two nights a week to clear my head, and try to plan something with friends at least once a month. How did you plan your study? I found that for me, it was important to set goals and milestones for each semester. To help me to do this, I made it a priority to list what my different lecturers flagged as critical in terms of preparing for an exam. In addition to this, the first thing I do before any lecture is to print off the lecture slides (most lecturers will put up the presentation the day before), take detailed notes of what material the lecturer is presenting and read over these and organise the notes into folders that evening while it is fresh in my mind. I like to plan well in advance of my exams, and work out a study plan based on what I need to revise and how much time I need to be spending on each topic. I think it makes things a lot easier if you have a written plan in front of you, as it helps you to focus on what is important, and the sense of achievement you get when you can mark it off your list is hard to beat! What was your preferred time to study? When you come home from a full day at work, the last thing you want to do is start studying. I would usually try to do some study at least one evening a week, but I often ended up feeling guilty about not studying the nights that I take a break! I do however devote at least an hour and a half each Saturday to studying and researching for my assignments, and as the exams approach I would also incorporate a Sunday afternoon study session. Which of The Institutes learning supports did you find most helpful and why? The study materials on Connect are great and I found them very useful when preparing for the exams. In particular, I found the mock and mini-mock exams to be very beneficial in terms of enabling me to focus in on revising the areas where I needed improvement and to get an understanding of the language used and format of the paper. As an apprentice I am lucky enough to get a live lecture every Tuesday, so I tend not to use the pre-recorded lectures on Connect. But for someone doing the stand-alone insurance exams, I highly recommend them as I feel they would be extremely beneficial, as I find that if I hear someone explaining something, I tend to remember it better than if I just read it. Who did you turn to for help? We are given plenty of opportunities to ask questions in class during our online lectures which really helps.We are given fantastic opportunities to develop personally and professionally and the lecturers are always on hand to offer guidance and assistance should we so require. In addition to my lecturers though, I found that my colleagues and supervisor were a phenomenal resource to have on hand as they could explain things to me in a really practical manner if I was struggling. The Member Services team at The Institute were brilliant and really prompt in responding to queries, as well as the Apprenticeship programme team, who are really easy to approach and are fountains of knowledge. What was the most challenging thing about studying? How did you mitigate it? One of the biggest challenges for me was handling the pressure that comes with studying and working together. Sometimes there can be a build-up of assignments all due together. This is unavoidable as you hurtle towards the end of semester, but add in a busy work load too and it all adds up. To combat this, I found planning ahead to be essential. Having a clear focus and understanding of what I was required to do really eased the pressure for me. How did you overcome those exam day nerves? Nerves on exam day are natural, I think there’d be something wrong if I didn't feel somewhat nervous! It goes without saying that putting in the work helps you to feel that you are prepared, but I also found that making sure I was hydrated and nourished to be really important. Drinking plenty of water before and during the exam and having some porridge that morning definitely helped set me up for the day ahead! Also, small things like making sure that you know how you are going to get to your exam centre, where it is and allowing plenty of time to get there helped to calm me down a little ahead of the exam itself. The Institute have an exam day checklist which is really handy and is available in the member area. How did you feel when you got your results? Excited but also nervous! Results day was the culmination of a lot of hard work and effort for me, so feeling a rollercoaster of emotions is only natural. 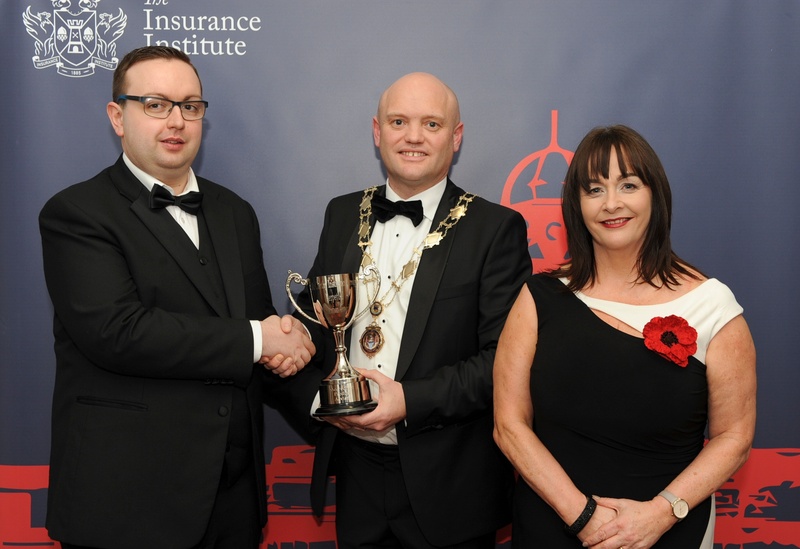 I'm so delighted to have received the award from my local Cork Institute though as it really means a lot to know that out of all of my local peers, I achieved the highest results. By October, I’ll have my CIP qualification and will be starting my final year on the apprenticeship. With the insurance modules done and dusted, it will be time to focus solely on the business modules and writing a dissertation on a particular topic of insurance. Work wise, I’m based in the renewals department currently, so the plan would be to continue to work in this area and apply all my knowledge through online lectures to the practicalities of daily working life. The apprenticeship has afforded me a wonderful opportunity and the sky is the limit in terms of where my career can take me.